EASY TO USE - Add included Skeeter's Reserve Premium Essence to whiskey barrel, top off with neutral rail vodka, grain alcohol or moonshine (alcohol not included) | Age to taste and enjoy | Order Skeeter's Reserve Premium Essence Reloads for future batches, 21 exciting flavors! Engraving Disclaimer: The image(s) displayed for this product are computer generated and intended to represent an engraved barrel. This exact design file is used by the laser engraver to personalize your barrel. Our laser engravers offer state of art technology, calibrated precisely to ensure constant power and speed delivery to the barrel head surface. Any fluctuations in the finished burn is solely "Nature's" doing as combinations of hard and soft grains can yield some contrasting (lighter/darker) results. This is part of the beauty that makes it truly unique. Just as no two pieces of oak are the same, your engraved barrel is a "one of a kind" masterpiece. You can be assured that American Oak Barrel™ will make every effort to ensure the quality of your barrel. Our products are handcrafted from American White Oak. Our "Buy With Confidence" guarantee warrants your purchase for manufacturer defect. All parts are guaranteed to function properly under normal operating conditions & American Oak Barrel™ will replace any non-working pieces within the first 90 days of purchase. *-NOTE: Virgin barrels in most cases leak during curing. THIS IS NOT IN ANY WAY A MANUFACTURER DEFECT! 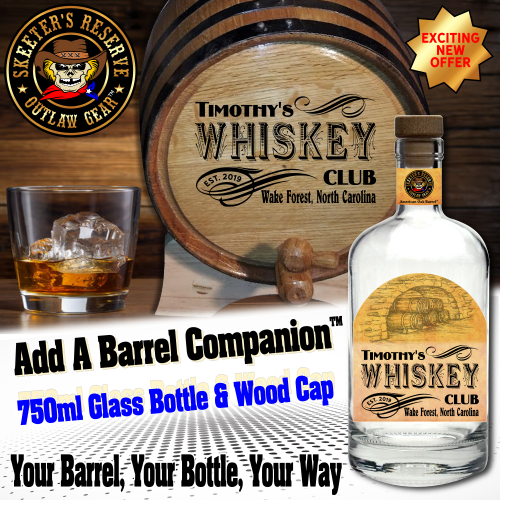 The curing process is necessary to swell the barrel & simple instructions are included. Once cured, your barrel will naturally seal & bring you many years of satisfaction & fantastic tasting spirits.